Russian Airborne Troops have just held the very first airdrop exercise of the year, faced with extra chilling weather. An RT reporting crew joined the servicemen, taking a wild ride in a transport plane. The first 2019 tactical drills were held this week at many locations across the western part of Russia. Paratroopers had the job of capturing and securing an airfield of a mock adversary, with some 800 soldiers and 80 pieces of hardware involved. Check out the thrilling video in below. 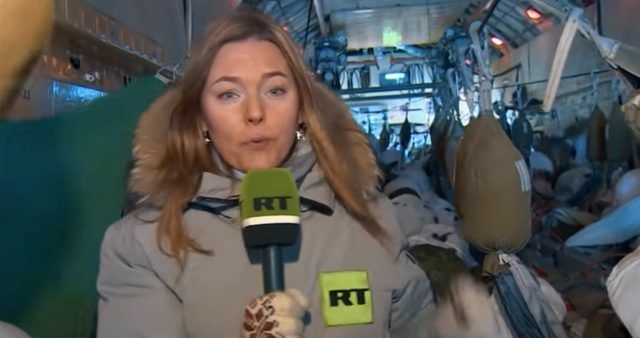 Russian Television reported before boarding an Il-76 transport plane, the paratroopers thoroughly checked their equipment. For an airborne trooper, any open buckle could cost his life. The soldiers are fully loaded with all the equipment they would carry to a real battle – assault rifles, ammo, armored vest, ballistic helmet and various other items. As it’s wintertime they are also dressed in white camouflage gear, put over their regular uniforms. RT’s crew boarded the plane alongside the troopers but didn’t seek to join them during the jump. The soldiers had to disembark the aircraft as quickly as possible. After jumping, they are on the ground within three minutes – ready to immediately engage in combat. The Airborne Troops (commonly known by their Russian acronym VDV) were created prior to WWII and have always been regarded as elite forces. The paratroopers maintain a state of high combat readiness, prepared to swiftly deploy wherever they are needed. The troops also have equipment such as airmobile light armored vehicles and artillery systems at their disposal.